Why investors shopping for high yields should pass on these stocks. Many investors prefer stocks that pay a hefty dividend. Not only can those quarterly checks boost long-term returns, but they also imply the business is growing at a steady, predictable pace. Reaching for a yield that's far above the market's 2% average can be risky, though. Often, the dividend is unsustainably high, or the yield may be elevated simply because investors have lost faith in the business and sent the share price tumbling. Below, I'll highlight a few examples of those high-risk situations. Redbox owner Outerwall (NASDAQ:OUTR) might seem like an attractive dividend stock at first glance. After all, management just doubled the payout, and it now yields a market-thumping 5.4%. In addition, the dividend is amply covered by earnings: The business is projected to pay $2.40 per share this year, compared to a profit of about $6.25 per share. However, those operations are shrinking drastically, and there's no telling when the slump will end. Earnings declined by 13% last quarter, and cash flow dove by 37% as Outerwall endured a sharp drop in demand for its DVD rentals. Customers checked out 18% fewer disks from its kiosks in Q1, sending operating profit down by 31%. Executives described the problem as a "secular decline in the physical market" for video entertainment. As a result of that shift and the drop in earnings power that will follow, Outerwall's stock is down 40% over just the last year. Meanwhile, a whopping 70% of its float is sold short, providing another indication of the deep pessimism Wall Street has regarding its business. Sure, a spinoff or merger might send the stock higher. But that's a risky bet for income investors to take just for a shot at an above-average yield. Kohl's (NYSE: KSS) dividend is shackled with several red flags that make it risky as an income investment. The dividend has only ticked up by 11% over the last year, but the yield has nearly doubled as the stock price slumped to a nine-year low. The department store chain is suffering from declining customer traffic that's forcing management to slash prices in order to keep inventory moving through the system. Earnings were cut in half last quarter to $0.31 per share as gross margin fell to 35.5% of sales from 36.9% a year ago. That profit result wasn't nearly enough to cover Kohl's $0.50 per share quarterly dividend. Things look better if you zoom out a bit, as the retailer produces most of its earnings in the holiday quarter. 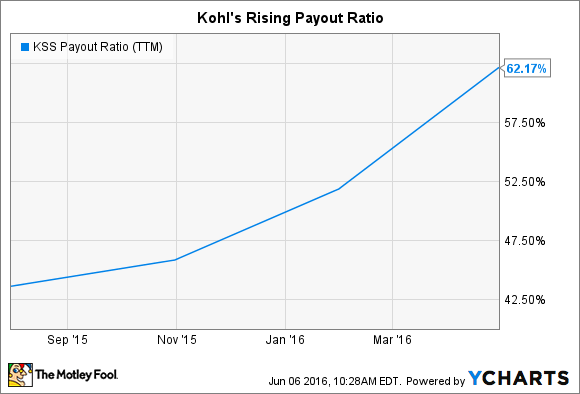 Still, Kohl's payout ratio has surged to over 60% of last year's earnings. KSS Payout Ratio (TTM) data by YCharts. In that environment, it's likely Kohl's will need to focus on shoring up its business over the next few years, which won't leave much excess cash for dividend raises. Seagate's (NASDAQ:STX) operations took a sharp turn lower last quarter as the hard-drive specialist generated its first quarterly loss in over five years. Demand for smaller-storage capacity drives dove and pushed revenue down in the process. What's worse is that management was surprised by the shift, which resulted in profitability of just 20% of sales -- down from 28% two years ago. Executives believe the problem is short term and will eventually be offset by growth in its large-storage capacity drives. These devices are in high demand as storage usage moves to cloud environments. "Our strategic focus is unchanged," CEO Steve Luczo told investors in late April. "We are broadening our storage portfolio to meet the needs of our growing global customer base, building upon our strong competitive position and optimizing our business for continued financial performance." That optimization process isn't likely to include a dividend that continues to yield over 10%. Seagate's payout ratio has spiked to above 200% of trailing earnings, and that pressure won't disappear soon. Consensus estimates project roughly $2 per share in profit next year, which wouldn't cover the $2.52 per share in dividends Seagate is slated to send to shareholders.